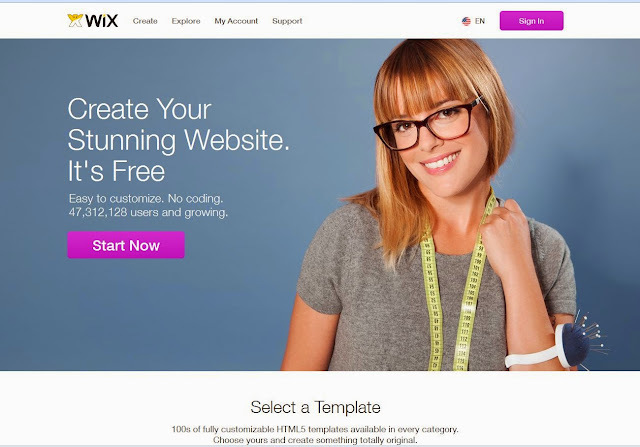 Looking for free online website builder? Or wondering how to make website for free? We have short listed some of the best online website maker for anyone interested to create a website. These are also easy website builder that require minimum programming and website development knowledge. The top website builders are well known, however there are other free website creator that offer specialized themes for different types of businesses and worth checking out before committing to one. There are many website builder reviews available on web with detailed analysis of pros and cons of each hosting company. In this article we have tried to stick to the best part of each of these providers. An undisputed fact: internet users rise with each minute passing as the global community soars to new heights. Another undisputed fact: one of the most common impulses for an individual is to express himself or herself. In the virtual reality this is most often done via creating a website or a blog. Third undisputed fact: even more people have grown weary of their jobs and try their luck with their own business. Thus we stumble upon the e-commerce phenomenon, hundreds of thousands internet users who seek their own way to make a living. The conclusion is clear: there is a constant, dire, even growing need of platforms that offer an option to create a website. The website’s purpose will be defined by the user – be it a blogger, an online entrepreneur, a company, a designer, a freelancer. But the website builders have to be there to start this creation process. So what are some good choices for satisfying this impulse, to quench this necessity? 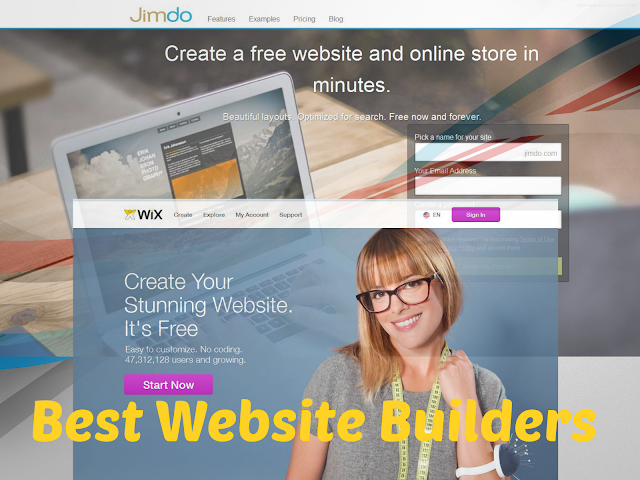 Here’s a list of free website builders that are a nice fit for your needs. The absolute giant in blogging, Wordpress is a pioneer of website creation. Sure, it can look a bit narrowed-down, but the platform has the biggest community and variety of all. It being open source is another bonus as this promises easy customization and loads of helpful support should you need one. 10+ years of tradition can never be wrong, so Wordpress is one of your best choices. You can easily find many Freelance Wordpress experts at absolute low cost to do the job for you. 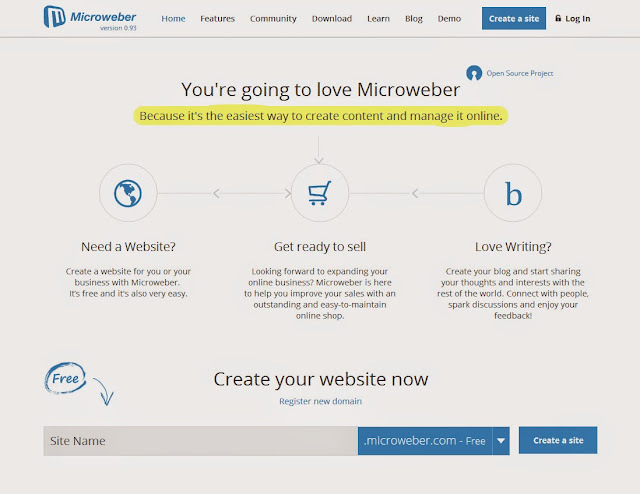 Microweber’s one of the new kids in the CMS scene. It’s an open source platform like Wordpress and comes with Drag&Drop technology for easier content management. Its signature feature is called Real-Time Text Writing&Editing which lets anyone work on their website interface “live” (WYSIWYG-like). 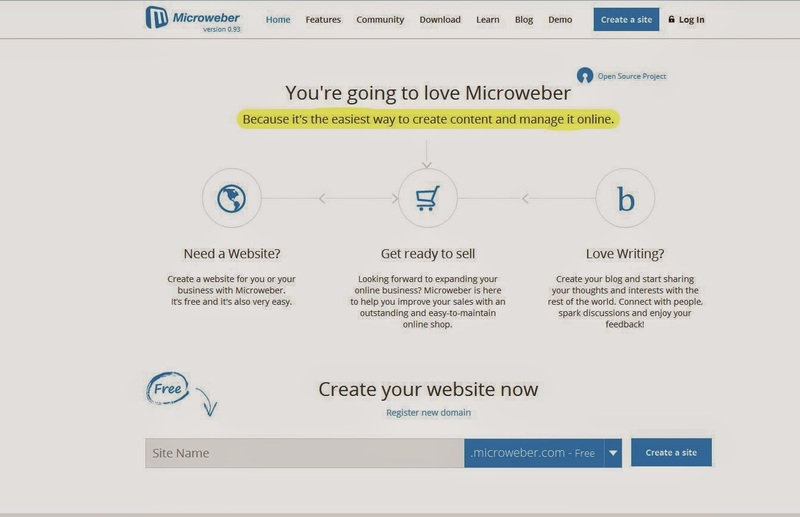 Microweber comes with a built-in e-commerce solution and is SEO-friendly so it’s a good option for entrepreneurs. IM Creator has some terrific templates that are a grand eye-candy. It’s also operating on Drag&Drop tech and makes creating a website an overall quick experience. It’s a very good option if you want to create a good-looking website with an easy learning curve, especially for bloggers or photographers. The downside is for e-commerce enthusiasts since IM Creator hasn’t got e-commerce features. Weebly has stuck on the scene for some time and has managed to keep its pace. It’s another website builder utilizing Drag&Drop and enables users to create a free website and blog. It’s pretty easy to use and requires on serious technological knowledge, so even the least tech-orientated users won’t have any problem with building a website from scratch with it. Wix is another of the colossus players in the website building game. It’s specific lies in creating free Flash websites – unlike most other website builders who let users create .html pages. Wix is also sure to offer rich customization and has a steady community that is ready to offer support and advice. Squidoo is a more simple solution as it lets you create only a lense (page) for your interests. Nevertheless it’s a free option that is suitable for users that want to share something more intimate and basic with the online community. Besides, a platform founded by Seth Godin has to be one of the top options, right? If you wish to be very fast and simple in expressing yourself, this is a good way of doing this. SnapPages is yet another platform that is married to the Drag&Drop easiness of navigation. The website builder lets users create websites in a fast manner, with responsive templates that are in a rich variety. According to the creators, they made a symbiosis of simplicity and powerfulness that users can benefit from. How can we forget this? Google has its own offer to all those who are eager to express themselves. GoogleSites is a guaranteed wise choice albeit a bit different from the competition we mentioned beforehand. If you’re a fan of being “all Google”, don’t miss this opportunity. Yola is a more e-commerce leaning website builder option. It comes with some business-specific features while maintaining an overall non-complexity feeling. There are a number of flexible layouts and personalized, custom designs. Yola is also good at scaling with your business, though some of its additional features are paid ones. Jimdo is a popular option that is suitable for bloggers or entrepreneurs alike. It involves no coding, is available for Mac OS users and has some cool templates. 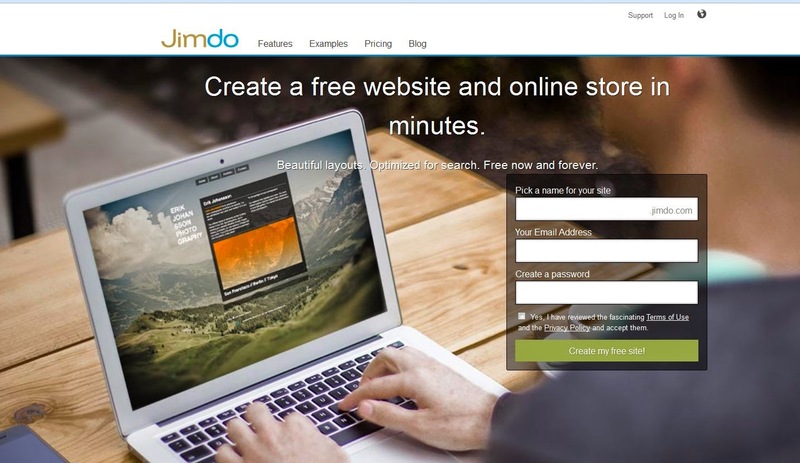 A good feature of it is its SEO tweaking – websites created with Jimdo have a blast through search engines ranking. It has a iOS app that allows you to edit your site on iPhone and iPad. Moonfruit is another beautiful option that is SEO-friendly. It’s praised by its terrific templates, although a number of them are paid. Be sure to take a look around their portfolio as it gives you some insights of your ways in unlocking creativity. The community here is strong too! Spruz? Well, Spruz is a more specific type of website builder. It gives you the chance of creating a website that is of a more social network nature. The free plan has built-in Chat and IM, Analytics and hosts up to 50 members. If you’re more leaning towards community causes and projects, Spruz is a more niche options you might want to take a look at. 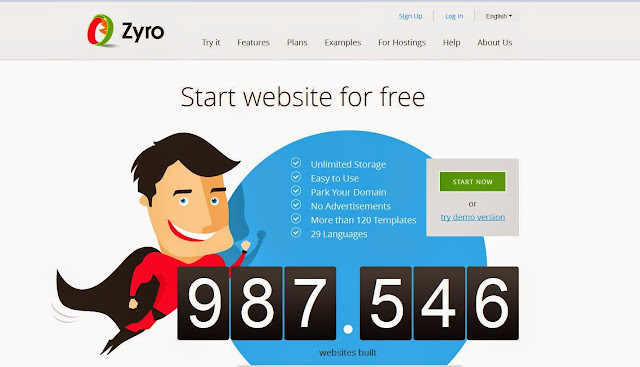 Zyro is another Drag&Drop website builder ensuring smooth content management. It’s also fairly rich on customization with close to 30 different templates for the free option. If you once again want simplicity, building with Zyro for free is a good choice. Unfortunately the basic builder functions (Text, Pictures, YouTube, Google Maps and some other multimedia) won’t be sufficient if you’re looking for something more. Doodlekit is perfect for blogs. It’s very user friendly, has interesting templates and provides an overall good user experience. For e-commerce enthusiasts there’s a free shopping cart that can be connected to a PayPal or Google Checkout account. Pick a template, customize it in a quick manner, and there you have your desired website. Zoho’s a famous website builder focusing on Drag&Drop and socializing. You can also create online forms with it and has an “instant publish” button for quick publishing. The good thing is that its free option storage is huge – 1 gigabyte, so you have a good amount of space for your needs. Still in its beta, Puzl sure stands as an adequate option to consider. Another SEO-friendly, socialized website builder that has a professional look and is pretty easy to setup. Any website created with Puzl is also mobile ready so this is a plus too. Tripod say that they’re perfect for small business and that sure rings true. Another Drag&Drop option for users with SEO included and rich template offerings. Unfortunately the free version has only 20 megabytes of storage so you have to play it safer with your files. If you’re not planning to add a good amount of them though, Tripod is a worthy option. Well, Flips is something different from the other list entrants. Hailing from Japan, this is a totally Do It Yourself (DIY) website builder. It’s an all-in-one, no coding involved solution that gives you a fast way to create your website on your own. Flips has an unique point system (1 point equals roughly 0.60$) that starts ticking after your 30-day free trial expires. You can nevertheless check it out! Webstarts is an option for every type of website, including e-commerce platforms. With mobile compatibility, it ensures your websites will look just fine on mobile devices too. You can also add slideshows and custom forms on your website, as well as good-looking galleries for some visual inspiration. Blogger is one of the most popular blogging tools, however very few people know that you can easily create a simple website with a attractive template on it. It supports pages that can be easily edited on its editor. Custom domains are also free. Github is a good place for hosting your open source tools related websites for free. Custom domain names are also supported free of cost. Devhub is provides a free website building option focused on small businesses. Webs is a simple website builder with many themes that can used just with a click. Webnode is a website builder for quick website creation. This allows your to use your own domain. Moon Fruit is a free website and ecommerce shop builder with many beautiful templates. Sauropool is website builder and also supports blogs, image galleries, bulletin boards and document folders. Another free website builder, has more features in paid version however the free version is good to create a simple website. Kopage is a free CMS and website builder for business and personal websites. Tripod has easy to use website builder with addons and support mobile websites. Yet another free webstie builder with ad supported pages. So there you have it – 20 beautiful platforms that will help you create your own virtual space. The plus side to the website builder niche is that there are lots of contestants for your attention. As you might know, wherever there is a strong and fierce competition, quality products emerge due to it. This state is a basic rule of economics and we surely see it also in the software sector. Peek at the website builders we listed, weigh their advantages and disadvantages and make your choice! Alexander Dimitrov is a journalist, short-stories writer and content creator/the all-around marketing person at Microweber. He’s also an appreciator of cultural diversity with a focus on the Middle East and South East/Far East Asia.